I've re-thought this. The above description sounds good. Thumbs up. But I wouldn't put a plaid or a stripe too close to the shoes. Meaning pants. And no argyle socks with those shoes. Unless you want to draw attention to your feet. I can't say they look bad. I love patterns like on this website here. I'm still looking for an outlet which carries this design, most of them carry the basic argyle patterns of X's and rhombuses. No creativity at all. I got some great v-neck sweaters from Banana Republic, but they're also expensive. Where can I get some more v-neck sweaters that are decent quality? I love v-neck sweaters lol. Macy's. But you need to work hard. Chamy, are you mixing the argyles with the patterned top siders? I LOVE argyle socks. But I'm beginning to think I'm not terribly with it anymore. Topsiders, I try not to wear socks at all, even if I do, it's plain black or white ankle socks which disappear into the shoes. If I'm wearing pants with sneakers, I do plain colour socks. These argyle socks, I mix them with my dress shoes and pants, they look really good, coz many dress pants are dull looking and the socks stand out, above the shoes. The picture I posted above, I'd love to have that with dark grey pants, black shoes and a white shirt. Good to hear. I was getting a little worried. And dizzy. I agree that Top Siders are best worn sock-less on men. I love Top Siders. 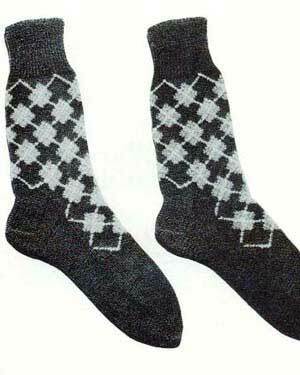 Actually argyle socks are part of the signature look of the men in my family and have been for years. So, do you have any favourite patterns?? Post your favourites , I'll eventually find a seamstress and make my own custom designs. Hmmmm.... Another reason to learn how to do that. (Post photos.) I can tell you DH is big on grays and silver with black for dress. Golds with dark brown. (I looked through his sock drawer.) No greens. Couple tan with dark brown. One pair that are dark blue with red that I hate. Those were shoved in the back. Guess green argyle socks are going to be in his stocking. It's the flint heather colour and it was quite cheap when I picked it up and it's even cheaper now for black friday. For pants, I found this chinos type of pants in nordstrom, which almost looks like a khakhi pants, but is not, perfectly lines my thighs in trim fit fashion and sits nice atop my shoes. The best part about this pants is that it still has some gap around the legs and it's not too trim where it looks like the leggings which girls wear. Straight fit is a much better term. And I'm rotating two shoes regularly, all winter. A cole haan and the bahama from sperry. I found a much better version in Lord and Taylor, but it looks similar. If I have to buy, I'll pick up the blue and red. Red always looks good on the antler man! Who else is on a buying spree? I went on a buying spree today, but they were gifts for other people. You're a pretty preppy dude, AC. Pretty nice stuff. Golds with dark brown is the absolute best. With dark brown pants, they just rock. If it's a brown shoe, it's even better. Black's alright too. I also love black, grey, silver and red combos too, usually 2 red rhombuses and nothing more. I like creativity in the design. I am not so sure about green and catchy colours like yellow, lavender and pink.